The billboard displays a simple message — “D ♥ B” — but it says a lot. Adams Outdoor Advertising approached the Tigers with the idea of the billboard, which is located on U.S. 23 near Ann Arbor and is meant to show support for the city of Boston in the aftermath of the Boston Marathon bombing on Monday. The digital billboard, which went live Wednesday, has a blue background. The “D” and the “B” that are featured in white are the logos of the Detroit Tigers and the Boston Red Sox. 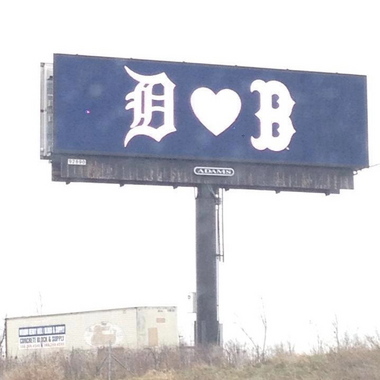 Adams Outdoor Advertising and the Detroit Tigers partnered to put up this billboard on U.S. 23 in support of the people of Boston.